HI guys, I've run into a werid issue on my car. Its a 73 240z, with a L26 with the mechanical fan remove and replaced with electrical fans. Car appears to have an aftermarket radiator on it that is reasonably new. What I've tried so far : New radiator cap, New thermostat, New overflow bottle, new overflow hose, new hose clamps, fresh coolant. The car idles fine, and will hold 180 all day. I get on the highway, temps start to creep up, clutch / go to neutral and temps creep back down to 180. Even weirder, after even the shortest drive, air shows up in the overflow hose from the radiator to the bottle. So then I have to raise the bottle and get all the air out again. After getting the air out, car will drive fine for a very short while (couple min) then temps will start to creep up again. Pull over, find more air in the overflow hose. The car doesn't seem to be losing coolant anywhere, but somehow air is getting into the system? Waterpump going out? I'm stumped at this point. Just a guess but it sounds like a mild head gasket leak. Exhaust gases are leaking in to the coolant channels. The bubbles and gases reduce the cooling ability and your temperatures go up under engine load. I haven't used them but I've heard that you can get a test kit at the auto parts store that will identify exhaust byproducts in the coolant. And your overlfow bottle should be vented to atmosphere so the "raising the bottle" to get the air out doesn't really matter. Probably good that you have a clear hose though so that you can see the bubbles. Was it working before the swap to mechanical fans? If so I'm tempted to ask if you wired them correctly. They do have polarity and can blow the wrong way. At speed on the street the fans should be mostly ineffective. Fans are for no or low speed. Of course, if they were installed in a way that blocks flow across the radiator, there could be a problem. The bubbles shouldn't be there though, after a few heat/cool cycles. It should just be fluid getting pushed and pulled from the overflow bottle. I figured if it was the head gasket, I'd see bubbles forming while sitting in my driveway right? The fans are blowing fine. At idle, the car warms up, the fans kick on, car cools down. They are in the right direction as well. This was my thought process too. 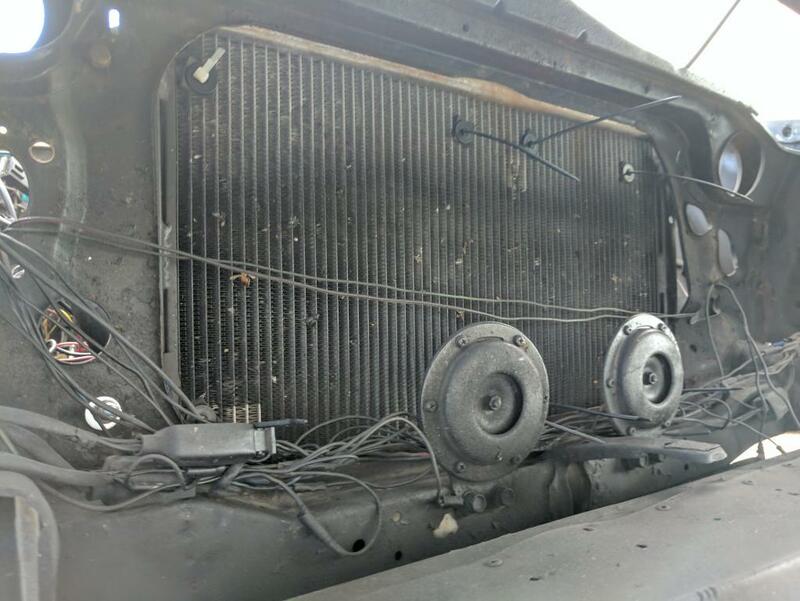 If the fans were the problem, the car would overheat at idle not at highway speeds. How man yheat/cool cycles do you think I need before all the air is out of the system? Maybe I just haven't had enough? Regarding the main radiator hoses, should I be able to compress them while the car is running? Judging from the cap, I would think I need to exert at least 16PSI to squeeze, them but they seem to squeeze fairly easily. So either there is more air in the system? Or the hose is collapsing under load from the waterpump? I get on the highway, temps start to creep up, clutch / go to neutral and temps creep back down to 180. Even weirder, after even the shortest drive, air shows up in the overflow hose from the radiator to the bottle. So then I have to raise the bottle and get all the air out again. Maybe spend a little more time on getting good evidence. You didn't give a number on "creeping up" from 180. 185 or 205? Give it some high load testing, like a few acceleration on-ramps and see how bad things get. If it stops at the same point and never overheats, you might be just nervous about nothing. Blown head gaskets are a fairly common cause of overheating, I believe. If everything else checks out, give it a test. Temp keeps rising until the red on the gauge (which I think starts at 205 or 210 on my VDO gauge), I haven't let it go past that as I don't want to risk damage. If its a blown head gasket I think you would be able to see the bubbles form in pretty much real time. Testing the coolant would be a good idea, although I've seen radiators blow apart when a headgasket goes. I suppose if it is a small crack or warping it could be gradual. 205*F is not terribly high. Boiling point is 212*F, and the radiator cap depending on what it is rated for (usually 16psi or about there) keeps the water from boiling to 212*F + the pressure rating. The factory red line on a stock gauge is at 250*F. What thermostat did you replace it with? If it is a 180 or a 200, it wouldn't open until it exceeded that point and would take a while for it to come down. Did you have to install a new temp sensor for the aftermarket gauge? If so was it in a new spot or the same spot? Have you had a tuneup recently? The fact that temperature builds up that quickly makes me think you may be running very lean if it is indeed getting to a too high of a level. The only time I overheated with electric fans was in 90+* weather sitting in traffic going about 1mph. Short of all that you indeed just might have a bad bleed. Make sure to cycle your heater if it is still in play. After market temp gauge, yes? Have you calibrated the gauge? You added coolant. Did you refill the cooling system completely? Did you note water flowing with the cap removed"
Can you identify the radiator? Stock, after market aluminum, etc. Post a picture. With the engine cold, remove the radiator cap and start the engine. Did the water level drop? If so, add water while the engine is idling until full and replace the cap. Can you see water flowing? Record temperature off-highway speed. Take a reading off of the radiator (probe between the cooling fins) near the return hose. And note the temperature reading on the dash gauge. Write the number down. Record temperature after driving highway speed. Take a reading off of the radiator (probe between the cooling fins) near the return hose. And note the temperature reading on the dash gauge. Write the number down. Let us know what the temp readings are and the results of driving highway speed after verifying that the cooling system is full. Never rely on dash gauges - verify by doing calibration checks. So is it actually overheating or gauge calibration? I had exactly the same symptoms with my stock 240Z and V8 240Z. The problem was water flow and radiator capacity in both cases. Was the coolant drained completely and then replaced with new fluids? If it was, you might want to try letting the car idle with the radiator cap off for awhile. My Maxima overheated after the plastic radiator blew up and after repairing it, my car would get near the red on the coolant temp gauge while on the freeway. When I let the car idle with the cap off, it pretty much burped out all the air and my car was fine after that. I'm not sure if the gauge is aftermarket, as I've never owned a Z before. The temp, fuel, and oil pressure gauge are all VDO brand. It came with the car when I bought it, I did not calibrate it as it seems to be working right. The thermostat opens up at 180 on the gauge. When I switched out the thermostat, we completely drained the coolant. Refilled it. Left the radiator cap open, idled, and filled with coolant as the coolant level would drop. Radiator is an aftermarket aluminum radiator from Champion. Cold start, coolant level does not drop. Water flowing? I can't really tell... (maybe this is the problem) Do you have a video example of what exactly I should be seeing? The water seems to be moving very slowly, and under throttle it moves a bit more. But I wouldn't really call it a steady flow. So if its not bad flow from the radiator, or the water pump. My only other idea is that it's running lean. But I have no real accurate way to test that. The plugs seem fine, and the exhaust smells like its running rich, but again this isn't accurate. Maybe ignition timing is causing issues? the car starts up instantly and has plenty of power. I have a new waterpump on hand that I can throw on. But if the waterpump was bad, would it produce any other symptoms? Leaks? Noise? That doesn't seem like too much work. While doing that, should I pull the radiator and have it flow tested? It seems relatively new, so I wouldn't expect it to be gunked up with sediment. Other things to note : the front half of the radiator is painted black, this might be hurting cooling capacity, but since it cools back down at idle, I'm still kinda stumped. Also, since the car is running hot, both the upper and lower hoses are very hot to the touch, so that seems like the radiator isn't cooling fluid very well. I'll see if I can get my hands on a thermometer to just be thorough, but I don't think the gauge is too far off the mark. Especially since the electric fans are on a completely different temp sensor, and they come on at 182. Get the low and high gauge readings and post. Don't swap, remove or change any more parts or mess with the timing or fuel system for now. You need to do a lot of reading first. Download a copy of the Factory Service Manual (FSM) for your car. They are free on-line from several sources such as HybridZ, ClassicZcars, various Z club websites. Check out a website called zenon that has FSMs for download etc. The FSM may have a trouble shooting guide for your problem. Look in the HybridZ downloads forum for the FSM. Or Google 240Z factory service manual. As long as you own a Z car you will need the FSM. Do a lot of reading on radiators and cooling systems. Google terms like: "runs hot at cruise", "engine gets hot at highway speeds" etc. Post some pictures of your radiator front, back and side. This question never got answered. Could be the old "I really want my new parts to work so I'll ignore the past" syndrome. "It can't be the new fans". p.s. I think that should be electric fans. The old fan is also mechanical. Side note - if mechanical why not electrical. Electrical fans. Doesn't sound right but maybe it is. ^Yes, sorry should have read "swap from mechanical fans," or "swap to electric fans." That is true, alternatively it should be mechanic fan. Plurality? Mechanical fans, mechanic fan, electric fan, electrical fans? VDO is aftermarket and not stock. The question is if the PO swapped the senders or bought the correct resistance range for all the gauges. Kind of hard to tell without an independent reading. If the sender or gauges are mismatched it could be reading off by a bit. Turn off, wait till car cools, open cap, top off. Jacking up the front of the car is required for me as I can't get a pan under the car to drain so it isn't really a second thought, but depending on how your suspension is loaded, driveway, etc you could be keeping a big air bubble somewhere in the system. VDO is aftermarket and not stock. The question is if the PO swapped the senders or bought the correct resistance range for all the gauges. Reason I asked him to take temp readings cold and hot and record gauge readings. I unfortunately don't have another gasket laying around, so I can't do this until I get a new gasket in. I can't reuse the old gasket right? Sorry. The car has electrical fans on it. It's had electrical fans on it since I bought it. I was not the one to swap to electrical fans. The reason I don't think the fans are of concern is, at speed the car is getting airflow through the radiator regardless of the fan situation. 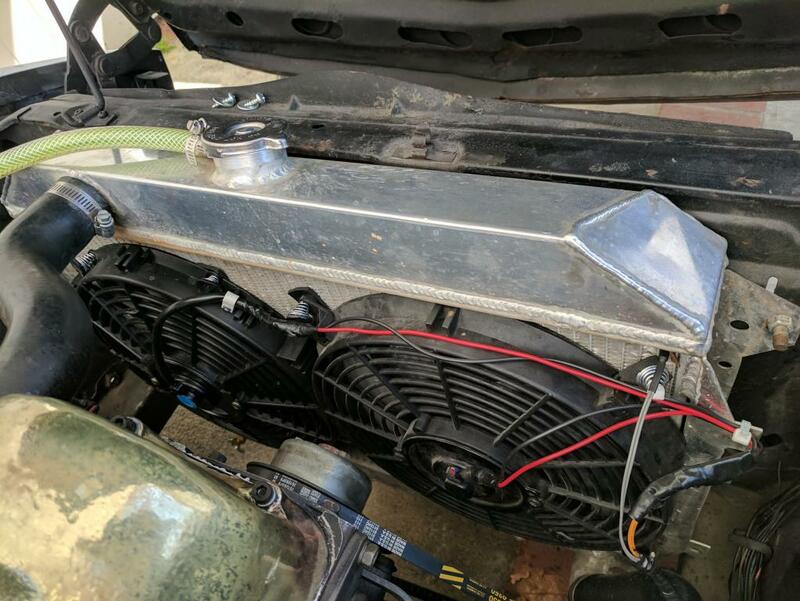 Even at idle, the fans are enough to cool the motor in it's current state. Its at speed that the radiator isn't providing enough cooling. I thought that's what it was as well, so this morning I jacked up the car and let it idle for quite a while, got it up to temp and didn't see any bubbles come out once the thermostat opened up. Regarding the VDO gauge, I will get temp readings this weekend when I have time to work on the car again. In the meantime, I got pics of the radiator front and back. No offense but we really just want a "yes" or a "no" for this question. If it was working but it's not now then you can focus on what you changed. If it was never working right and you added the fans to try to fix a problem maybe you're looking in the wrong place. If you don't know if it was ever right then you have a potential can of who knows what kind of worms to mess with. The car has had electrical fans on it since I've owned it. It came to me with electrical fans on it. Sorry if that wasn't clear in my posts. It's not that I changed the fans and it started heating up like this. I thought it was just pertinent information to share about the car. The car used to run fine and not heat up. Then one day it started having these symptoms. Which lead me to start replacing the common things : radiator cap, thermostat, flush coolant etc. Its a 73 240z, with a L26 with the mechanical fan remove and replaced with electrical fans. I see. The sentence above made me think that you had just done some mods. One day it started to have problems is a good clue that something was working and stopped. Could still be a head gasket, or a stuck thermostat, or a coolant flow blockage. The "one day' part does imply that it's not a gauge or an air bubble causing the problem. It would be something that can happen to a system that's working properly, some sort of failure. Helps narrow the focus. Could be as simple as a loose V belt if it started suddenly. What should the tension in the belt be? How much play? Also, when I go to check the thermostat, how much should it be opening? Thanks for the help guys, sorry about the confusion. Grab belt and twist, shouldn't be able to turn it to 90*. You are missing a fairly common piece to the replacement puzzle, it usually is water pump, thermostat, coolant flush. Is there a reason the water pump was not replaced? Even on fairly new motors I've seen the pumps start loosing bits or rusting out depending on what coolant was used. Any screeching noise on startup, or whining from the front? If it is slipping it could also be the bearing in the pump going bad or a combination of the pump and loose belt. I'll check the belt. But it doesn't make any screeching sounds, ever. I do hear some noise from the motor, but I can't narrow it down between regular valvetrain noise, or if its the waterpump bearing. What kind of sound should I be hearing if its the water pump bearing? Changing the waterpump was the next step I was going to do. I went with the cheapest / easiest options first. While the water pump is out and the coolant is drained, I'm doing to test the flow of the radiator and check the thermostat again. Anything else I should check while doing the above? How much should the thermostat open up when it's up to temp? Google "how to test a thermostat" Also, YouTube has videos on this. You will need a thermometer for this test. Go buy a digital thermometer. A belt can slip with no noise.